i had just finished making the rotisserie and moved the car off the temporary dolly. i was pretty nervous the first time i flipped this car around! made my own set of subframe connectors. nothing on the market was what i wanted. 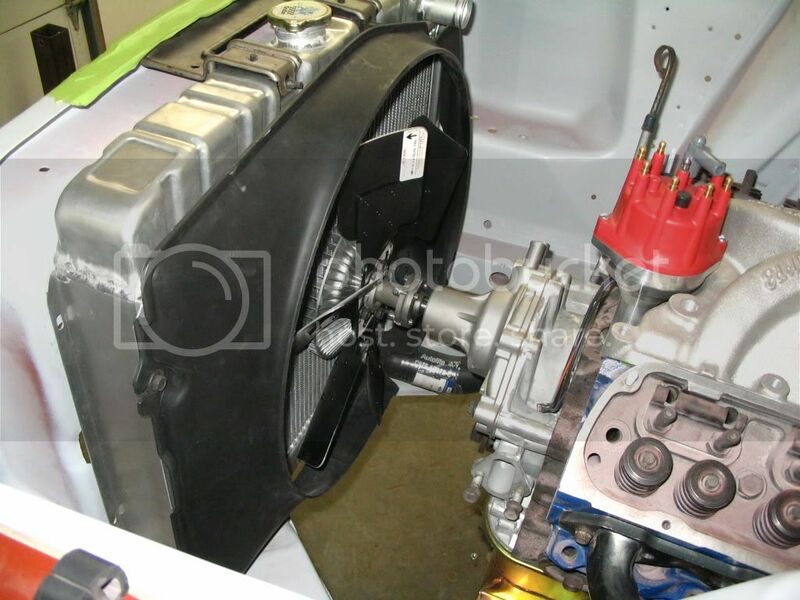 i've been working on mocking up the engine, transmission, cooling, etc. TFS high ports, scattershield and a victor junior have created a challenge. finally finished up the clutch linkage, modifying the headers (had to completely relocate two tubes. 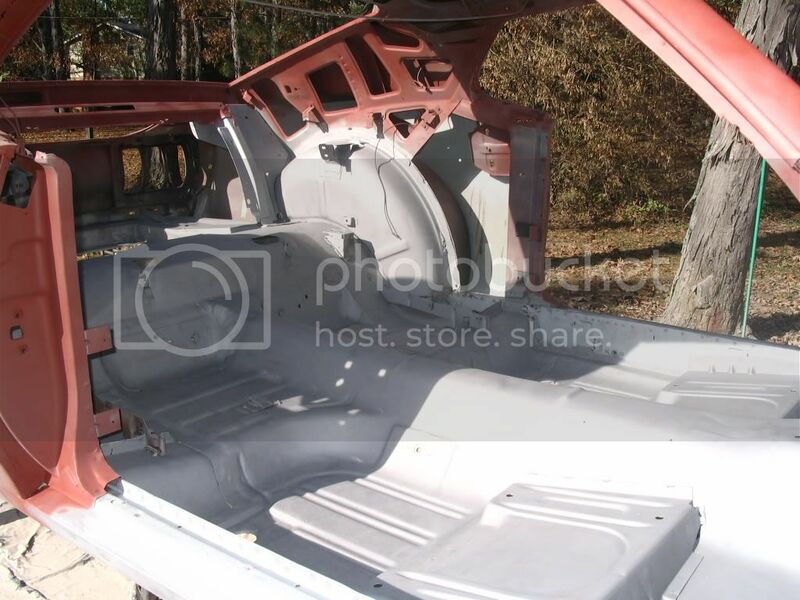 i've sliced up the shaker and have finally have a legitimate plan to fit it under the hood and retain the vacuum system and external appearance. it's about 1/2" high in the picture. previous owner sliced out the transmission tunnel and crossmember, to probably gain access to the shifter. they used pop rivets to hold metal in place. cutout the front crossmember, lower part of the radiator support, inner front rail and strut rod bracket and battery inner apron. replaced inner front frame rail. this piece started life as a reproduction rail. unfortunately the shape was wrong, the holes were in the wrong location, etc. i had to reshape it, fix the ends to make it look like the original, relocate the holes and make the two divots in the edge. 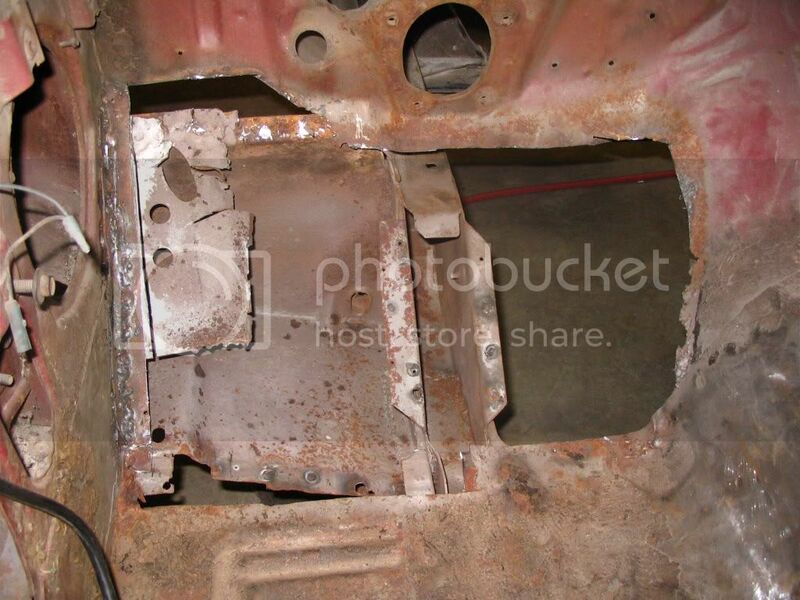 the toe board, upper and lower torque box as well as the front floor support and frame rail were in bad condition. cutout the cancer in the frame rail. 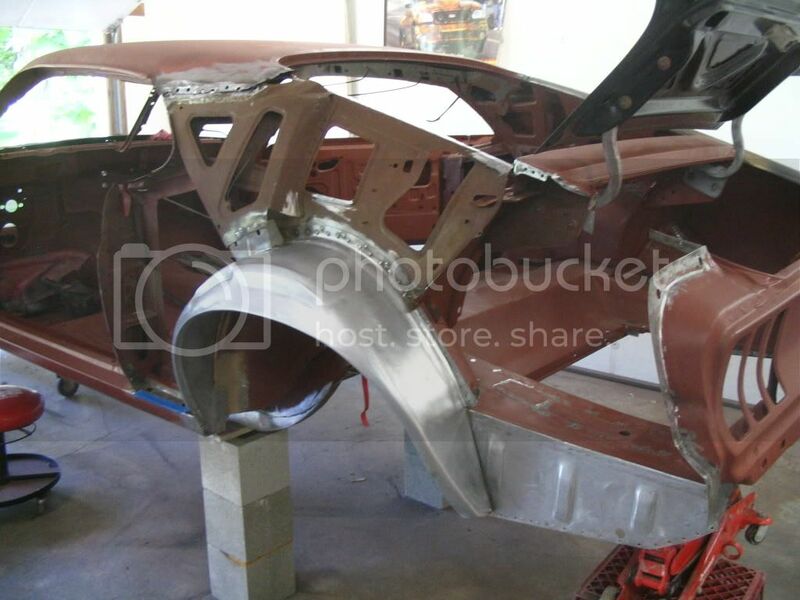 the firewall to floor was the only metal hold the front end together on that side. made patches to the front frame rail and again heavily modified a repop front floor support to weld in. 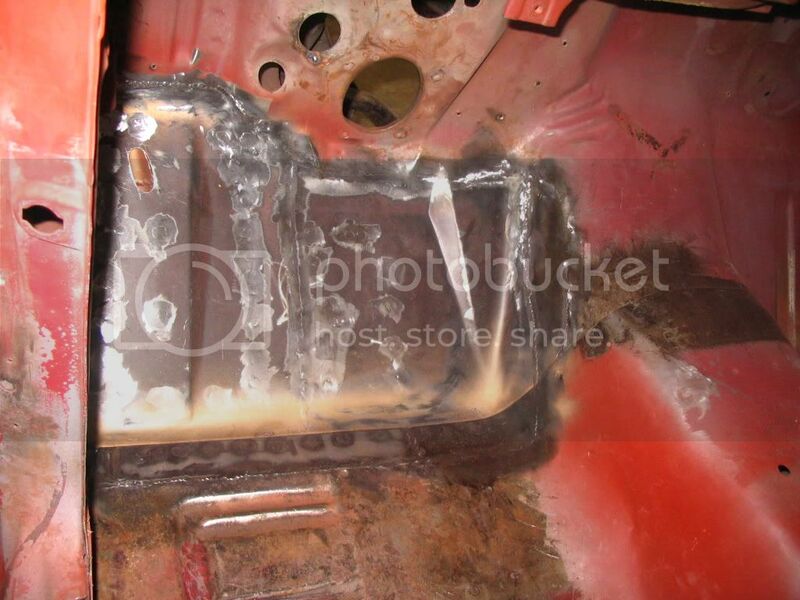 welded in a new toe board after welding in the torque boxes and repair of the inner rocker and apron. 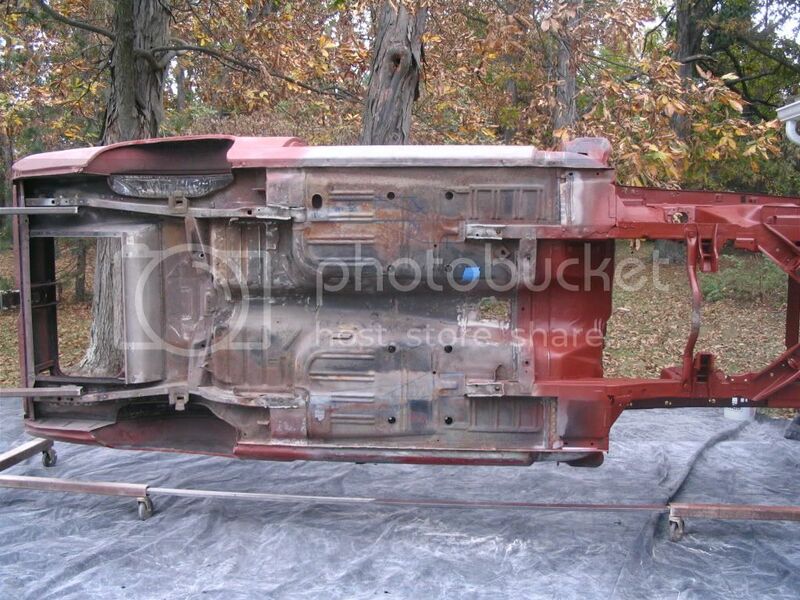 this repop piece was for a 67/68 mustang i had to make the contours work. winter was approaching and enough structural metal was replaced to warrant placement on the rotisserie for media blasting. i masked off a small area so i could later paint match the color. did the inside as well. media blasting the car was the worst three days of my life. but worth it. 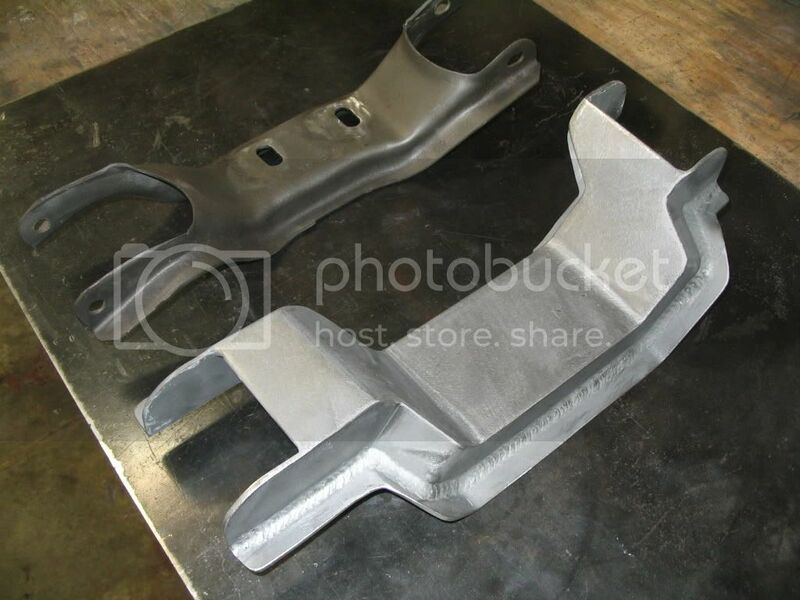 this was just some of the fabrication involved in making the subframe connectors. i had to relocate drain holes, recontour ribbing and move brackets as part of the prep. these are made from 1/8" steel. a lot of plug welds tie these things to the floorplans. i counted over 200 plug welds involved in replacing one rear quarter. 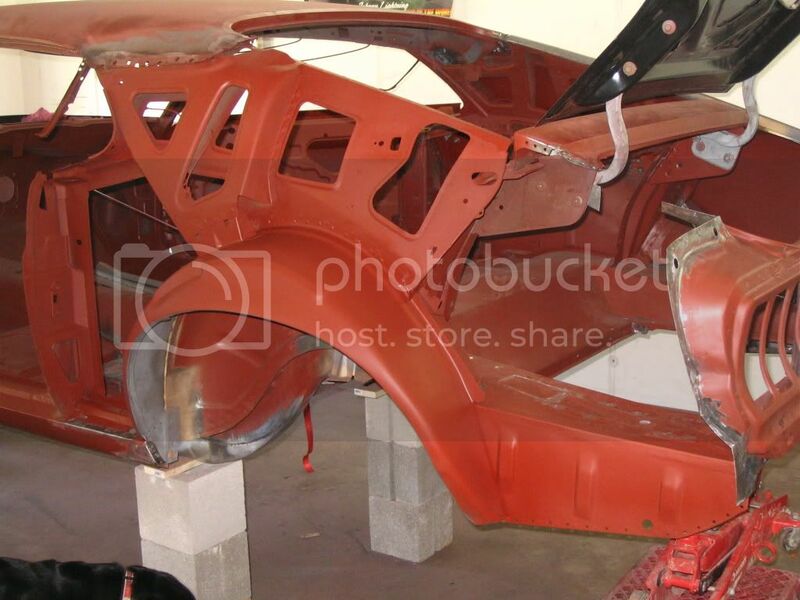 drivers side inner quarter area. 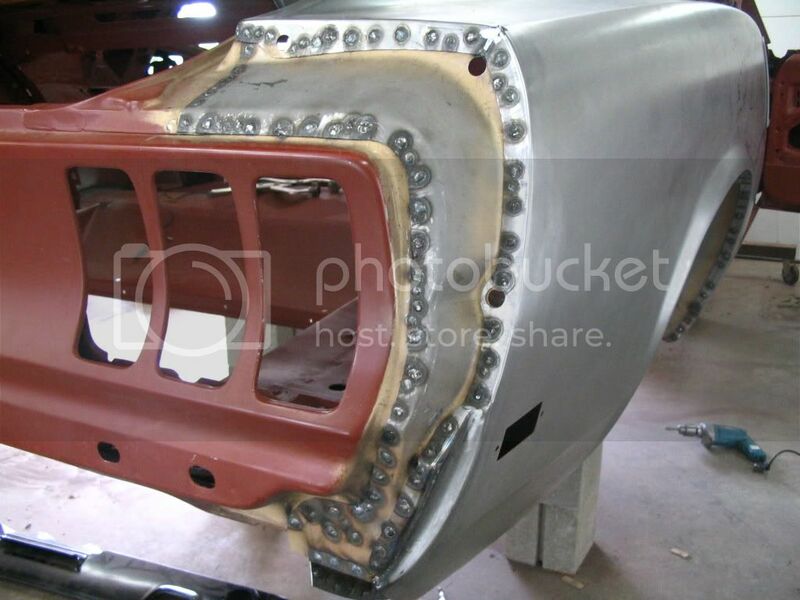 i had to fabricate and replace the end of the outer rocker, fabricate two different inner wheel house patches, patch the trunk drop off and weld in the outer wheel house. the repop outer wheel house just didn't want to fit right without a lot of massaging. i stripped the metal, including the inner side of the quarter pain and sprayed epoxy throughout. 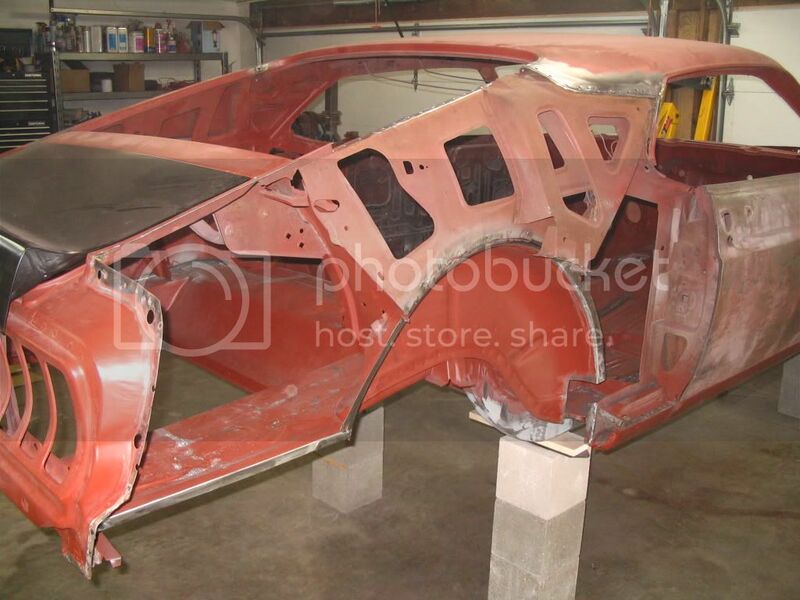 just a picture of the car back up on the rotisserie after quarter replacement to finish the undercarriage detailing. 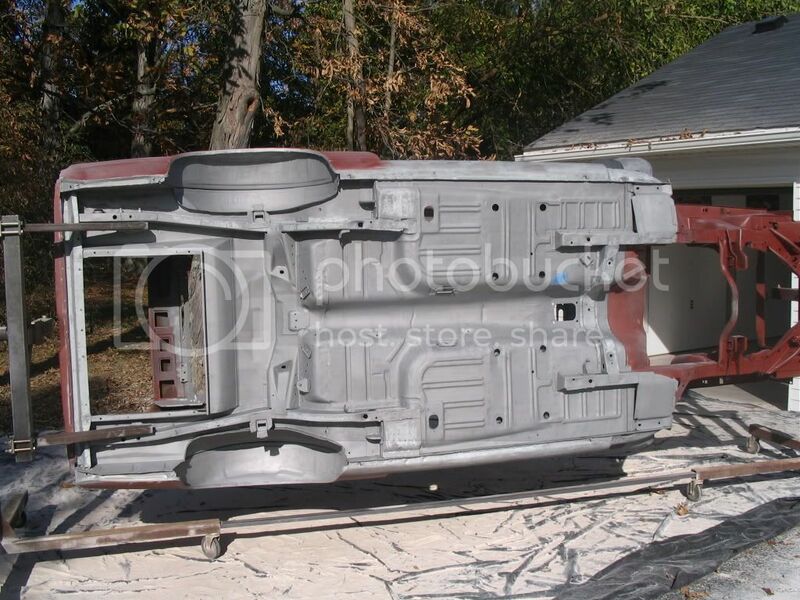 if you've never seen a car upside down here you go. 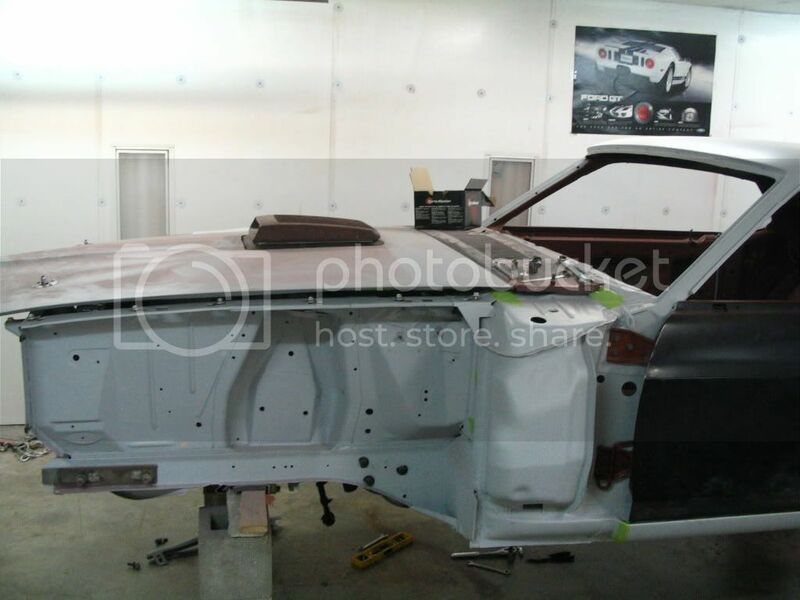 i've sanded every inch of this car inside and out to remove any imperfections and pitting from rust. i had no finger nails for weeks. the door gap was inconsistent and a little large for my liking. i weld in 1/8 rod to the door edge (welded on both sides) then ground flat. the edge is ground to the contour desired. 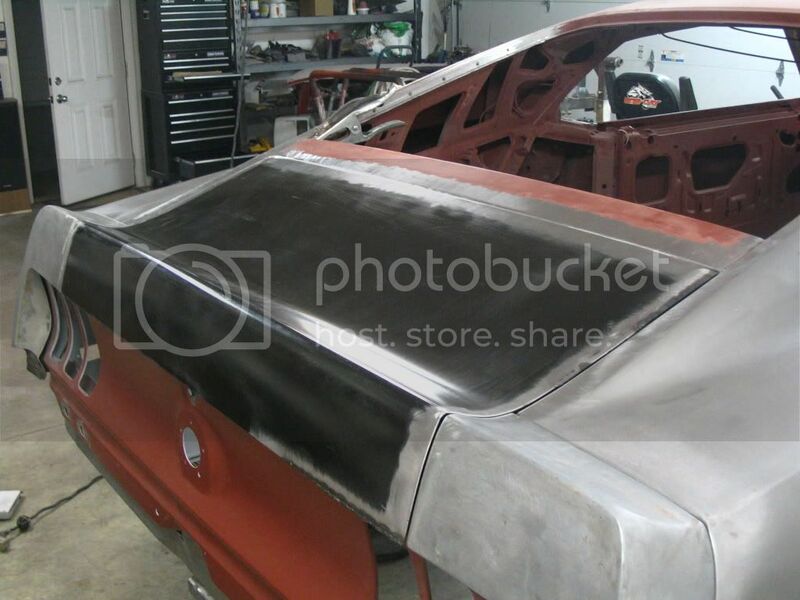 same thing to the trunk lid. i litterally had to jump up and down on this thing to get it close to matching the contour of the rear window crossmember. had to grind and weld/grind to many locations on the lid. these lids never fit right even from the factory. Looking good, your frame connectors are mint. Did you post a pic of them a while back? Awesome job, BuckeyeDemon. I am so envious. Keep the pictures coming. Those subframe connectors are really something to be proud of. Very clean. Looks like it came that way from the factory. Great job. thanks for posting the pics, looking good! I'll be there soon enough! 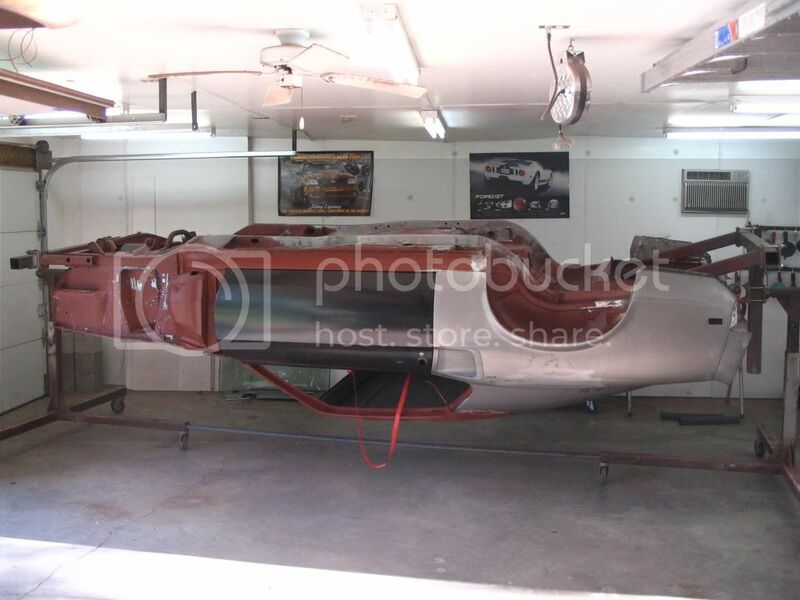 I have the same problem with my New trunk lid, it fits really nice on the outaides but in the middle its higher than the rear window X-Member. What the secret...Really jump up and down on it? LOL I dont want to have to add filler to the X-Member to make it match the trunk, but was considering it. 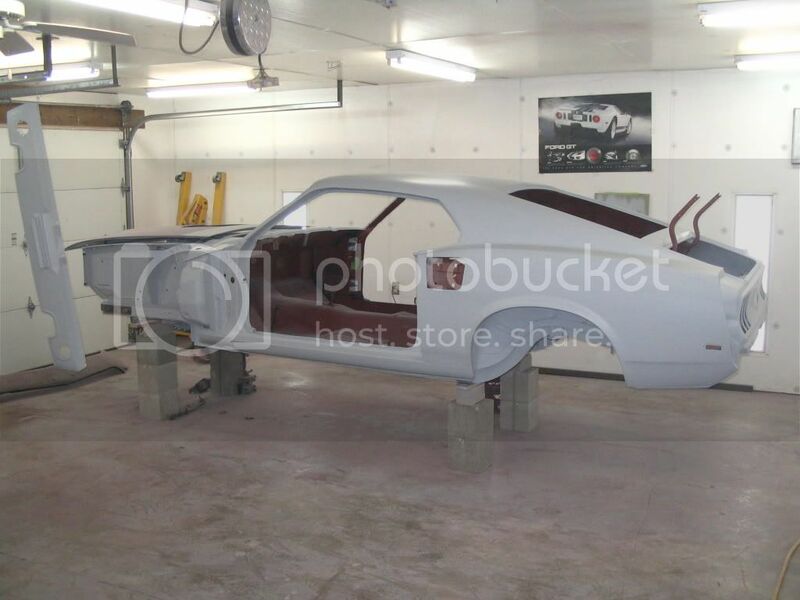 Also where did you get the 1/8" rod that you welded to the doors and trunk Lid....This is something I would like to do also, as my door gaps are a littler larger than I like, but they are within spec...I use a Paint stiring stick, which I have found to be just about the right size for gaps, but I want this car to be a bit tighter. You got yours looking GREAT. 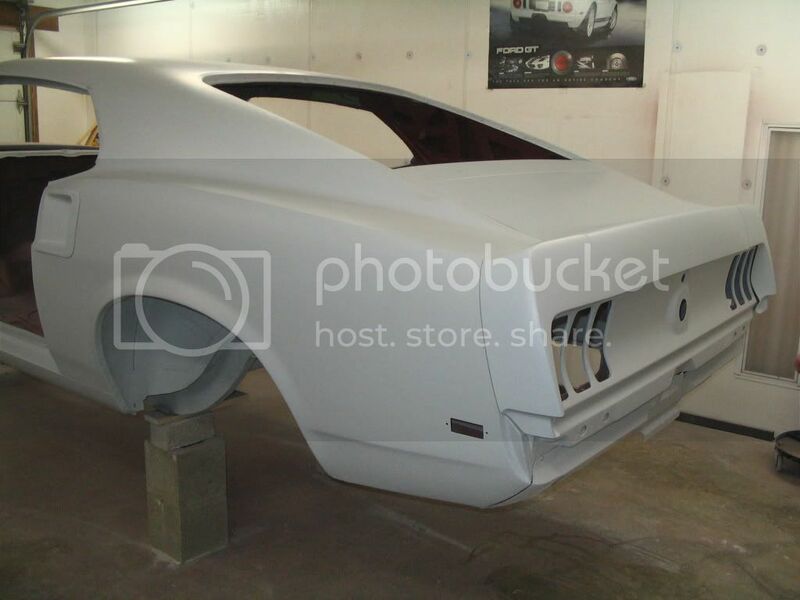 What do you think about weldng the rear valance to the quarters on both sides, and filling it in to make it seamless in that area? That is one area I have always seen a gap in that I think needs to be corrected, Even the expensive Stangs have the valance wither too fare in or too far out, or the gap is huge. 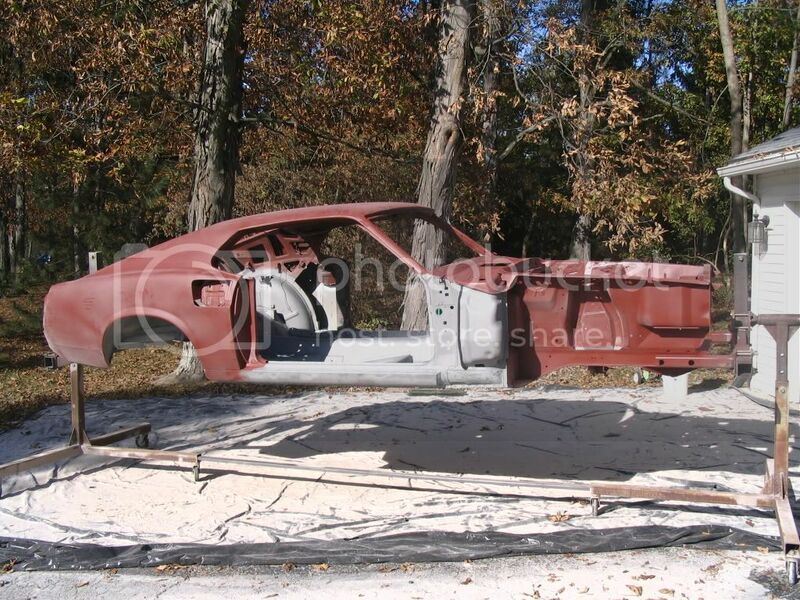 Also did you take the body of your car down to bare metal? 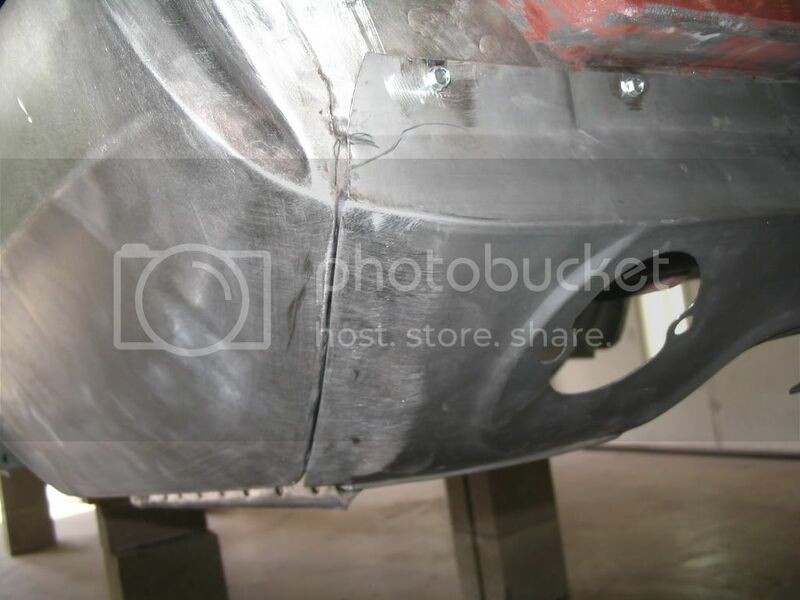 If so what do you find is the Fastest and easiest way to get it down with out having scratches that are so deep in the metal that a good high build primer wont fill them. 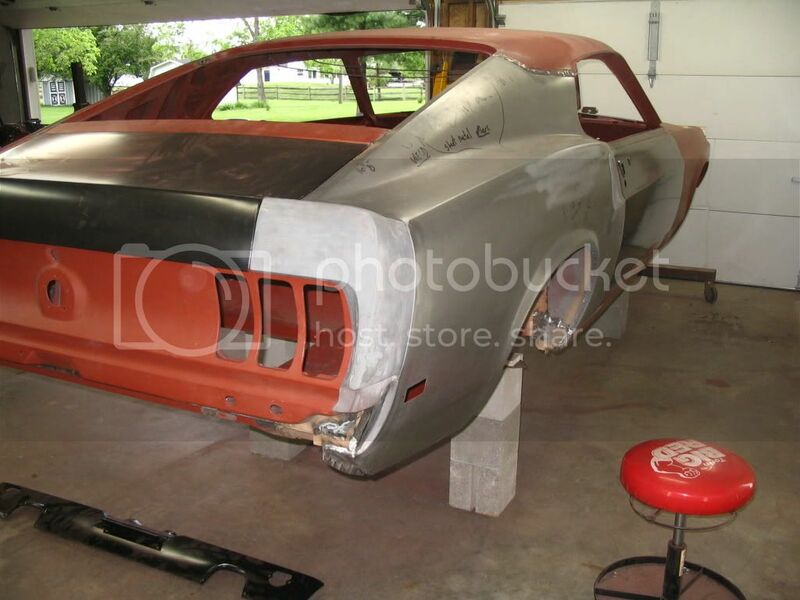 I have considered using a good stainless bristle Cup brush which seems to knock paing and bondo of with ease. Also, are you migging or tigging those rods into the doors and trunk lid ? 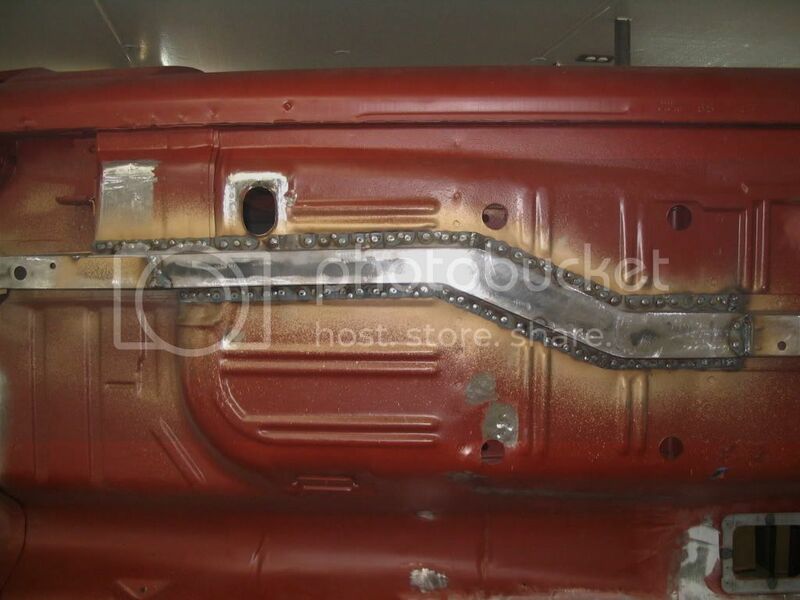 What ever your doign looks great, I see the picture of the trunk where you have the rod welded on and then a completed picture. 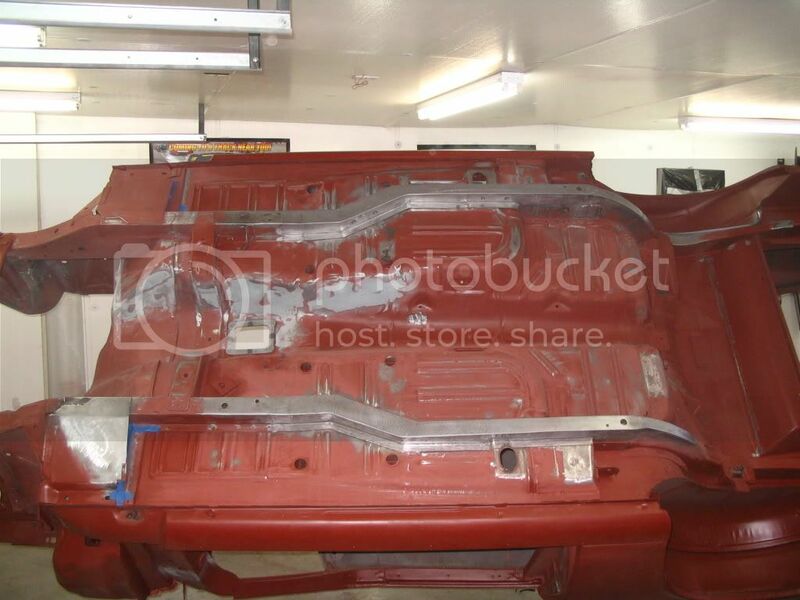 What im wondering is did you keep tacking the rod until you had a complete bead down the entire length of the lid, or did you just grind the welds down and put filler in it. Awesome work. 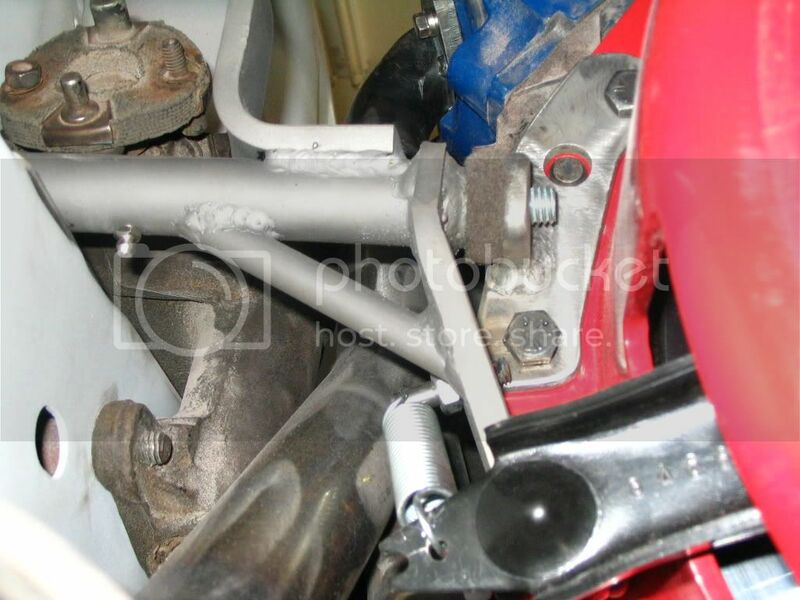 Great job on the subframe connectors. Very very impressive, I am amazed at how clean the car looks, you have a lot of skill and talent, and it shows in the work you are doing. 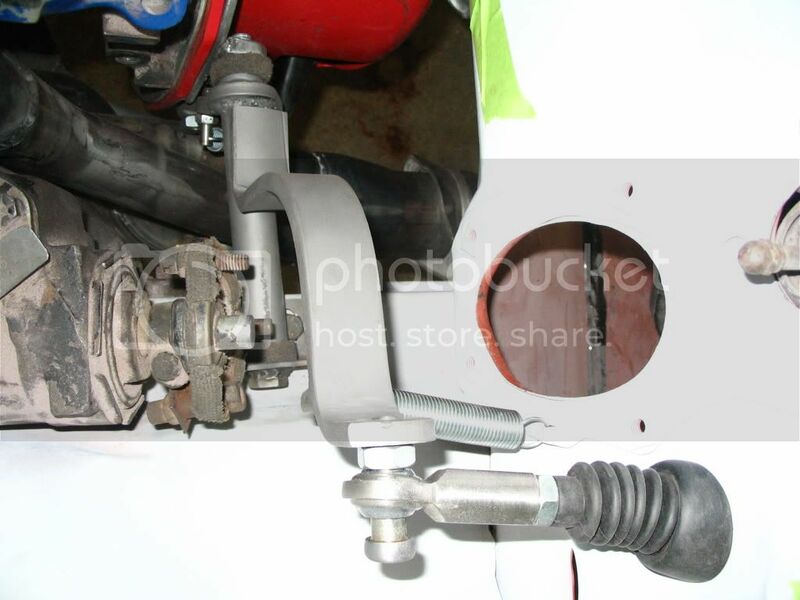 Great photos, and thanks for showing us your progress, you have set the bar really high, keeps the photos coming..
thanks for the comments on the subframe connectors. that was a labor intensive process, but indeed wanted something that looked like what the factory would have designed. 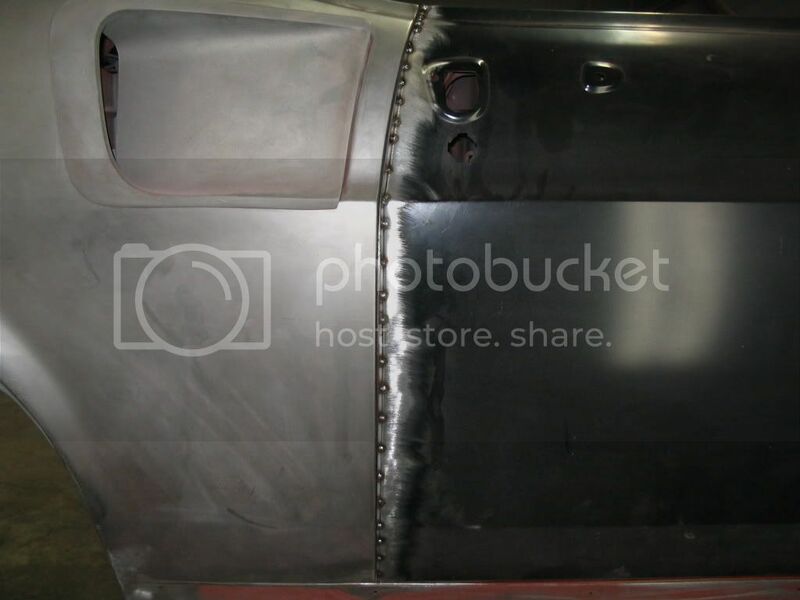 trunk lid. yep, mine was sticking up in the middle. i did litteraly put the lid on the floor and jump up and down on the side to flex it flat. because the lid didn't have the skin welded, it flexed quite easily. i still had to do a lot of hammer and dollie work to the edge to get it true. the lid was so flimsy that it would loose it's shape when i would open and shut it. 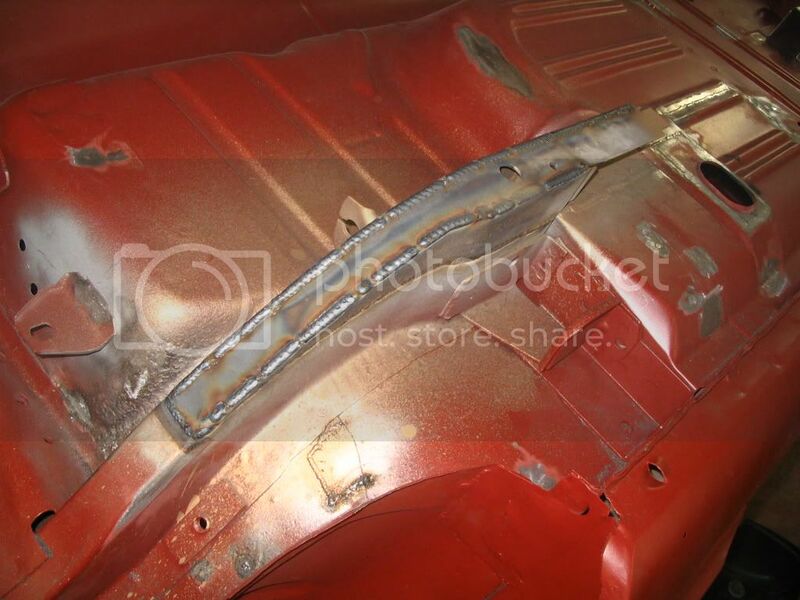 after welding it was much more solid. i also tack glued a new piece of weatherstrip in to make sure the fit was right with the weatherstrip. i didn't want any surprises after paint. i buy 1/8 flux coated arc weld rod. i chip off the flux (then media blast or wire wheel to get the remaining residue off). i tack weld the rod down the edge. 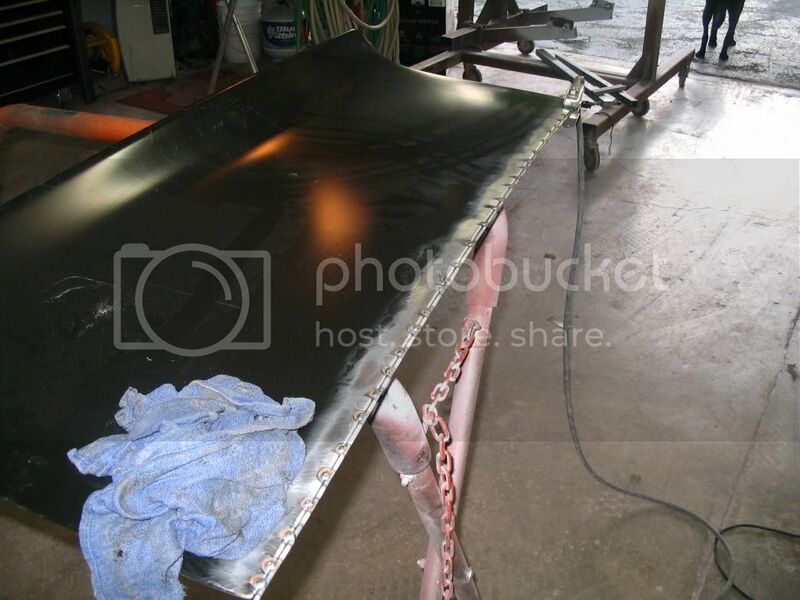 i completely weld both sides using small tacks, cooling after each tack with compressed air or a damp cloth. i grind the the surfaces flat. 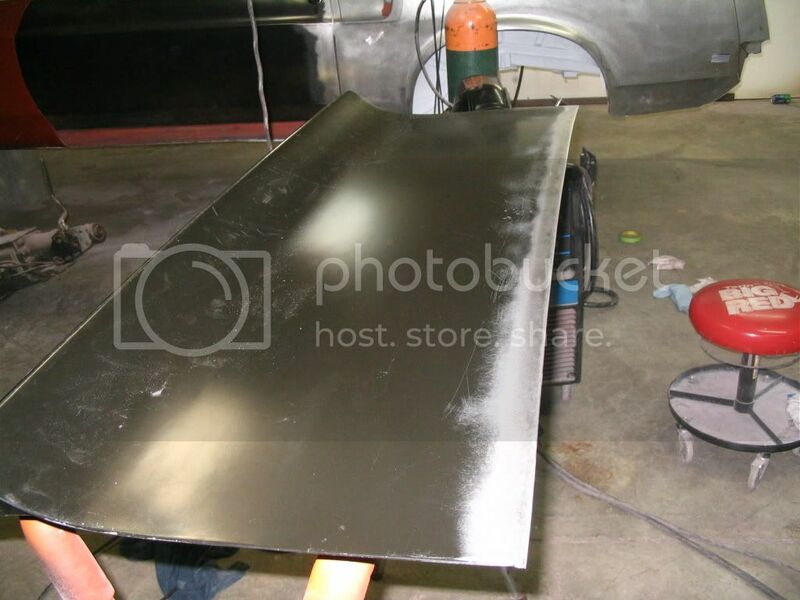 i skim coat the panels when all the metal work is complete. i do have to grind the edges down because in many causes the 1/8 rod is too much. i use a d/a to get a slight radius when it's done. rear valance. i'm sure you could weld it solid. to much of a deviation from stock on the exterior for me. i spent a couple hours on the rear valance to get the fit right. 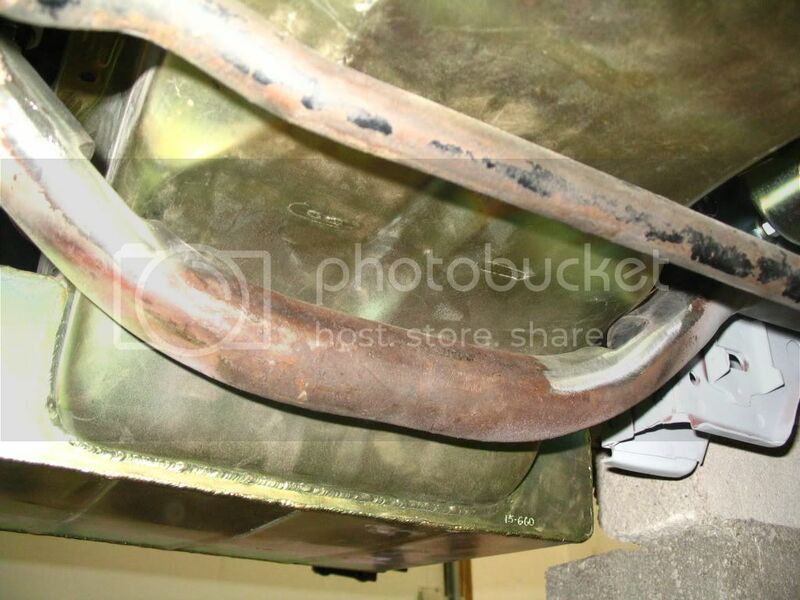 with all the metal that was replaced, i can't necessarily say the valance was bad. here is the fit after some work. 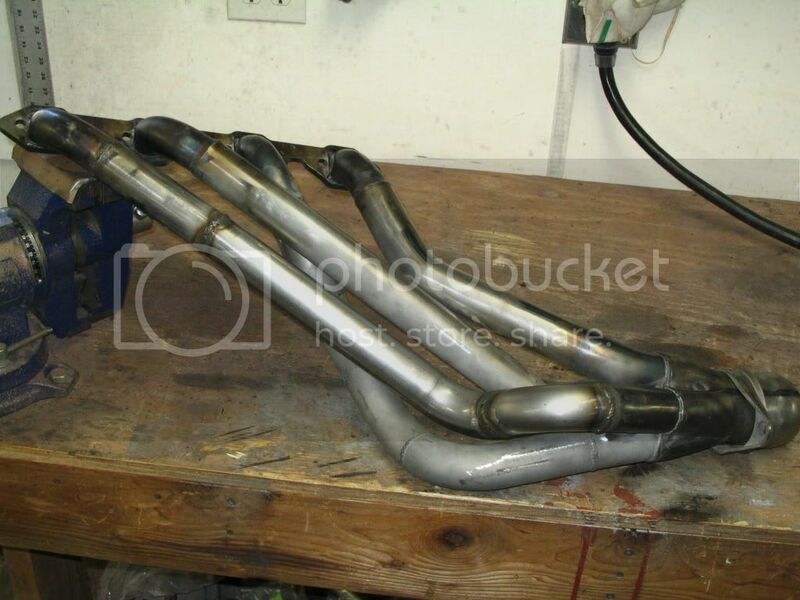 There has got to be some money to be made on those frame connectors they are perfect.Need to send a pic to a subframe maker and get more made I'd love a set .I am far from being a welder my welds take alot of grinding haha. Your rear valance fits beautifully compared to my remplacement valance, its got almost a half inch gap at the top LOL, part of the reason I want it all welded into one. Great work and car. I wish I was that talented. Keep it going. 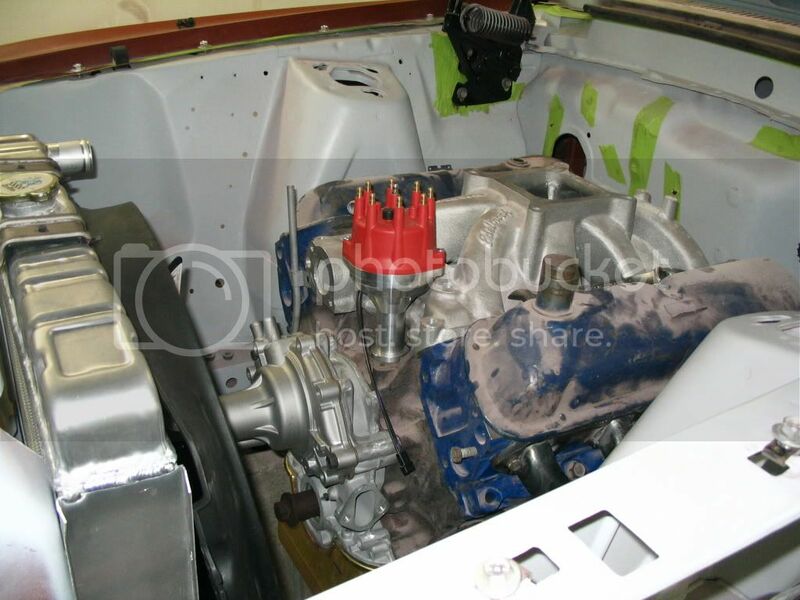 the last few months have been spent on fitting some of the driveline. as mentioned this is a 351W car with TFS high port heads. The one complaint about these heads is the raised exhaust ports (3/4"). I have a set FPA 1 3/4" stepped long tubes. i expected clearance problems, so i ordered them uncoated. they have excellent clearance to the chassis. 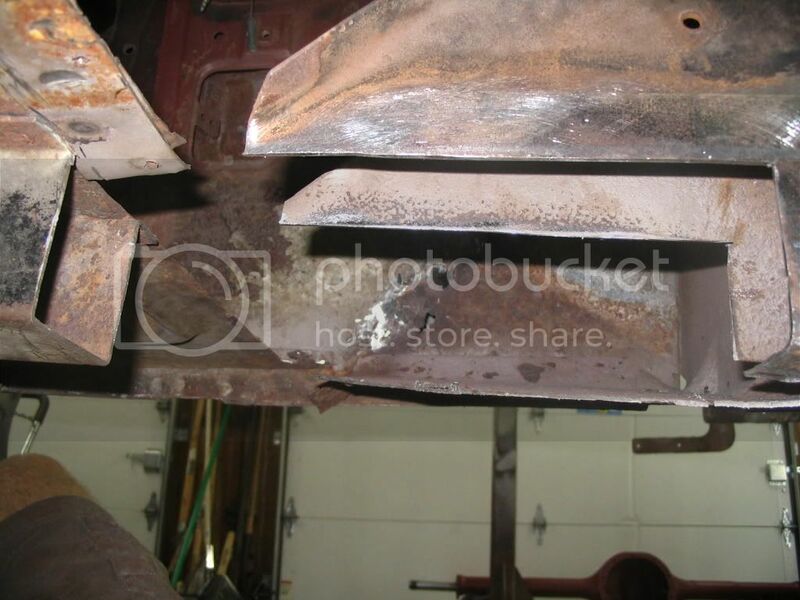 however one tube was hitting the oil pan both on the mounting flange and the side of the pan. this was NOT because of the raised port heads. one of the tubes just really seemed to go where it shouldn't have. i will count this as the one strike on the FPA's. because of the shaker and a victor Jr. intake that sits considerably higher, i decided to drop the motor using ron morris drop mounts. i didn't want to do this because of the potential dominoe effect, but i'm trying to squeeze every 1/10" i can get. i also decided now was the time to convert to a 5-speed. i spent several days reading trying to determine how much modification would be required. i've read many posts concerning driveline angles, many of which i don't necessarily agree with. 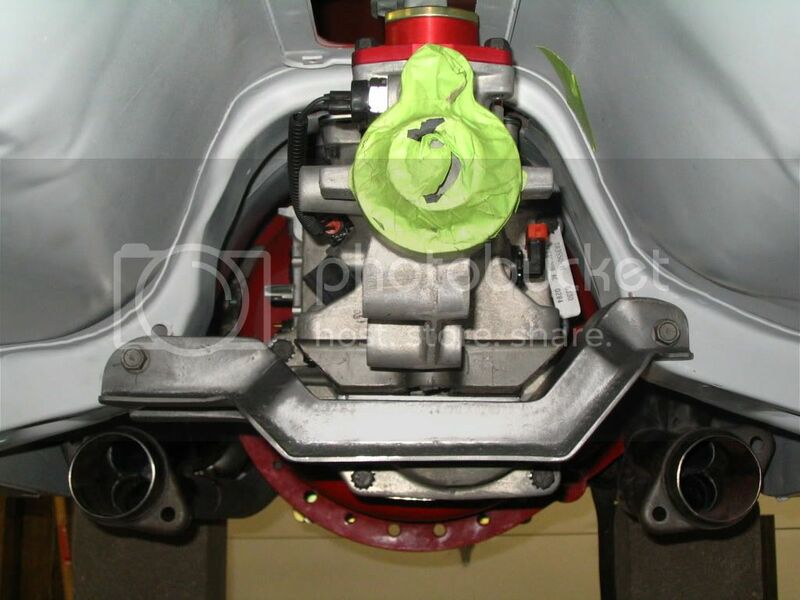 this is a TKO 600. the bellhousing is for the early toploaders. 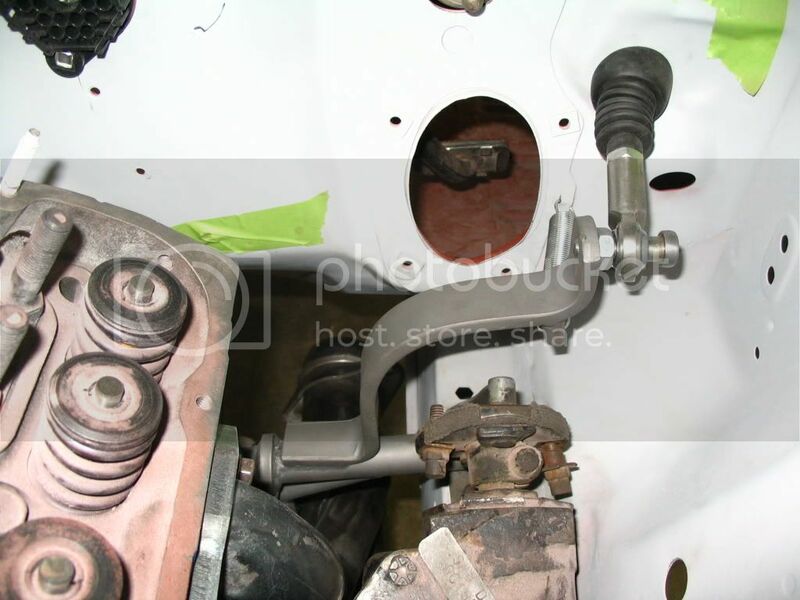 i used the spacer plate because of the longer input shaft. i have a little concern about this spacer because it seems to fit a little sloppy. if i were to do it again, i would have ordered a shortened input shaft version. that would have shifted the trannsmission forward 0.675". 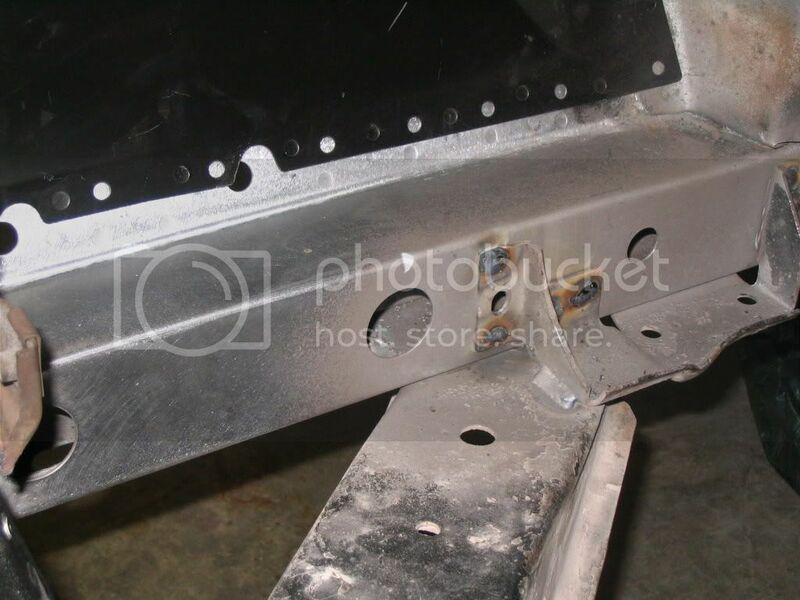 This would have reduced the amount cutout of the floor support and reduced the needed offset of the crossmember. i'm not a fan of the aftermarket swap crossmembers. i wanted the liberty to make something similar to a stock piece while allowing me to position it where i wanted. finished crossmember. 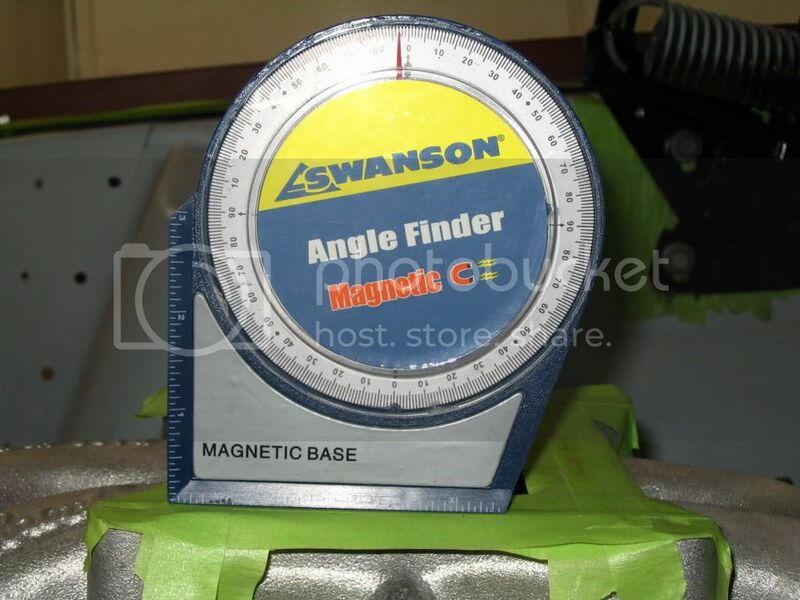 it has an offset of 1.5" and is made from 10 gauge steel. this stupid thing took me two days to build! here is one of the trouble spots. i had to cutout the support. 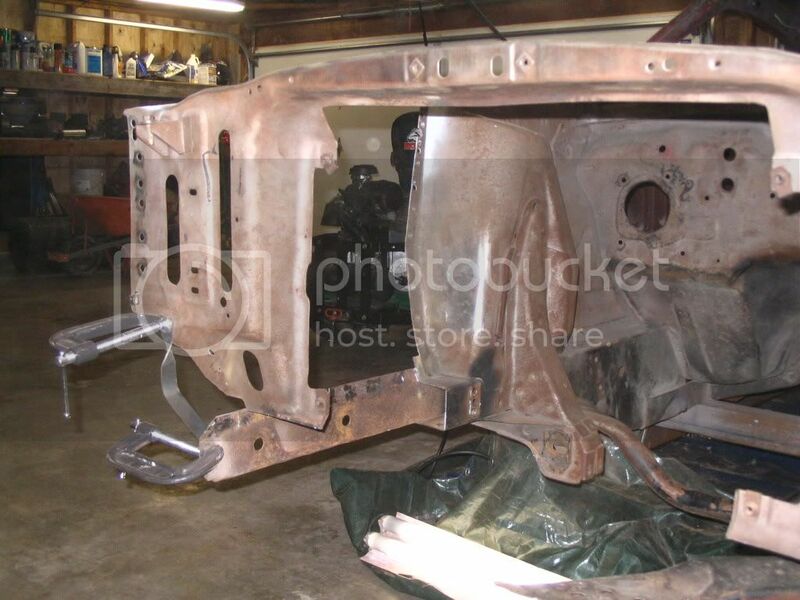 i will box the support in once the car is back on the rotisserie for the final time prior to getting topcoated. as mentioned early, i could have cut 5/8" less if i would have used the short input shaft version. there is probably 5/8" to 3/4" of clearance here. the tight spot exists about 10" forward. 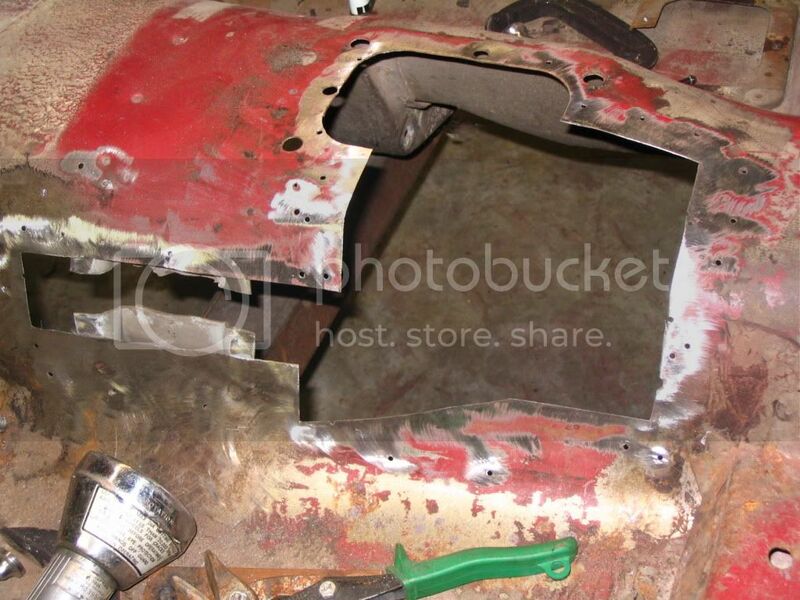 there is currently about 1/8" of space right where the floor pan meets the firewall (overlap area). 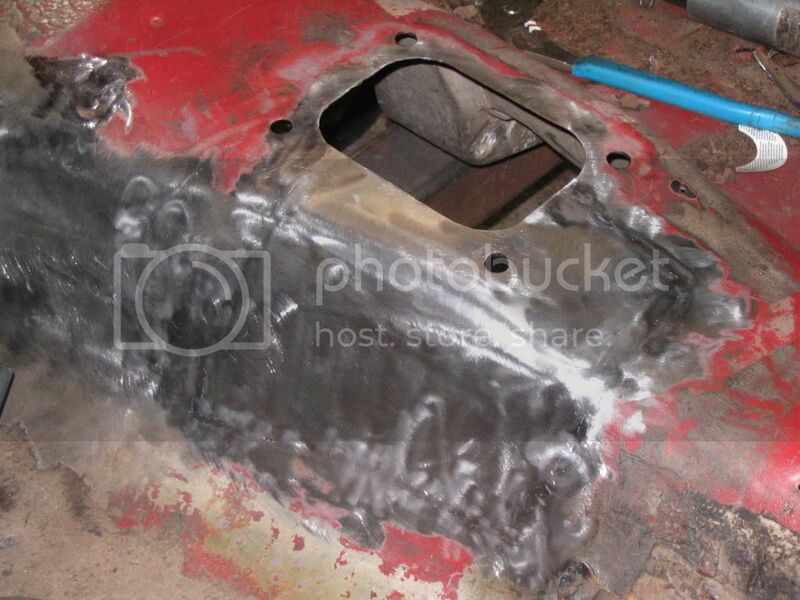 I'm going to have to cut a slit, hammer it out a little and then reweld to get about 1/4" of clearance. after everything was bolted down in the final config (including engine drop mounts), the driveline angle for reference is around 2.75-3 degrees. before the mods i recorded a measurement of 2.5". this mod has added about 0.25-0.5 degrees. 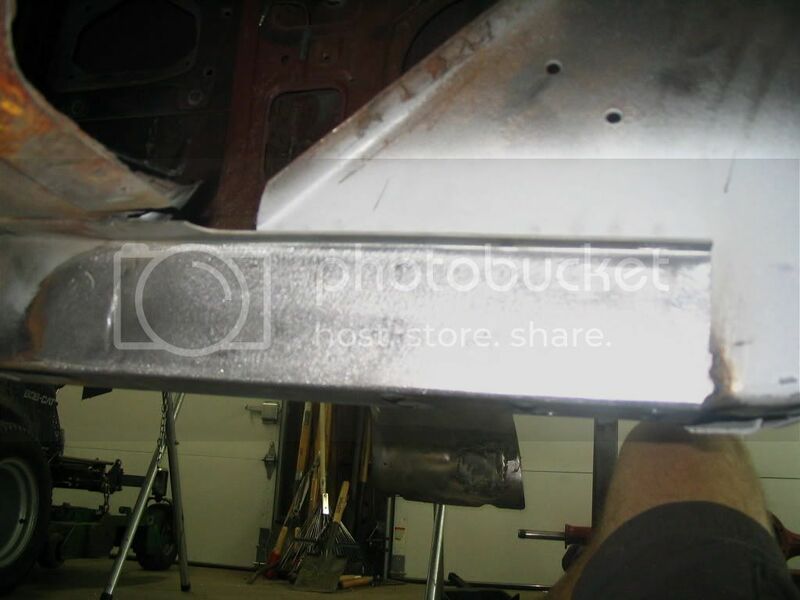 1. the car is not level (rockers measure about 0.5 degrees. 2. there can be error in the degree meter (mine was off 3 degrees, so i had to open it and shift the paper). 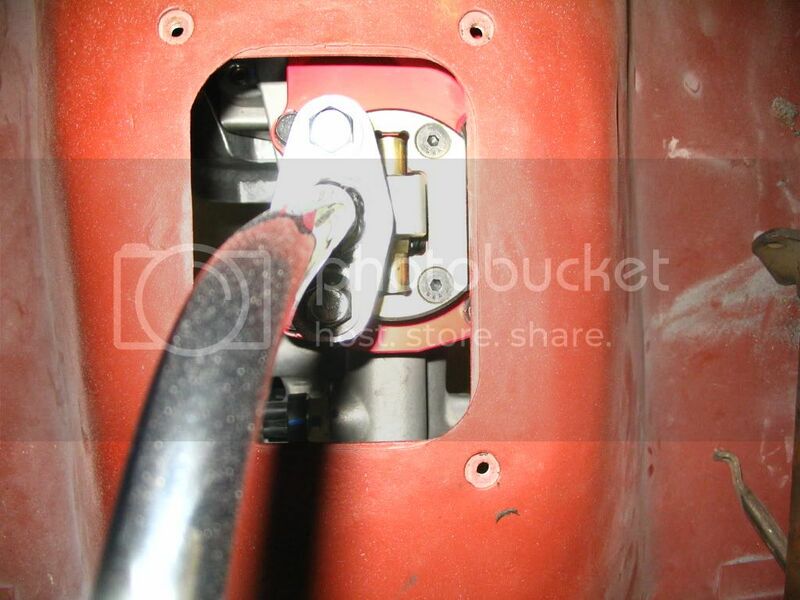 the key angles are driveline to driveshaft, driveshaft to pinion and driveline to pinion difference. i have no idea what angle my driveshaft is. thus another reason why i tried to minimize the added angle. generally i read that you want less than 3 degrees of driveline to driveshaft angle (not engine angle with no reference). another reason was the shaker. dropping the tailshaft was going to make it even more difficult to fit the shaker under the hood. i read many times about people who say there fan is sticking up in the air at a severe angle because of this swap. not the case here. it's tough to see any angle for the fan to radiator. i think dropping the engine 0.5" made a huge difference. this is a Griffin radiator. it was supposed to fit in original saddle type mounts. it does sort of. it is a little thicker, so i had to grind less than 1/8" from the rubber isolators at the top. in addition it must be overal thicker. i had to re fabricate part of the lower mounts (make them wider and move them towards the motor 1/2") and add about 1/2" to the top saddle support so that it wasn't touching the radiator support. in addition, because of the dropped engine, the fan was almost hitting the shroud at the bottom. i trimmed about 1/4" from the edge of the fan blades to achieve about 1/2" of clearance. more of the dominoe effect. the engine crossmember had to be notched. because of the 1/2" drop and the larger oil pan. 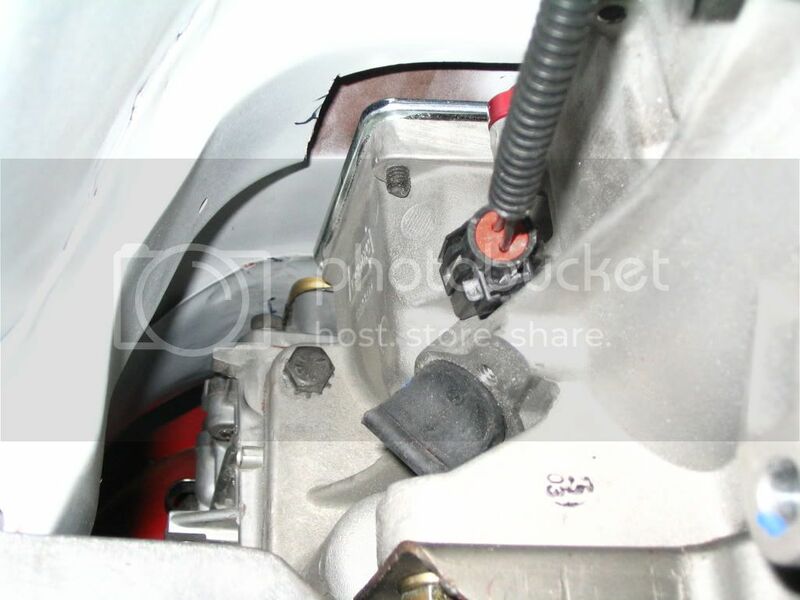 i'm also having a little clearance issue with this Canton 7-qt pan and the steering center link. it is hitting the one side of the pan about 1/4". i'm hoping that once everything is bolted up (steering) that it won't be a problem. if it is, i have a plan. with two of the exhaust tubes completely relocated already and the engine moved around, the z-bar setup was having big problems. first i converted everything to heim joints. this are simply 1/2" female threaded, teflon coated, stainless heim joints. i cut and threaded a 1/2" rod (had to put a slight bend in it). the studs that the heim joints mount to are simply 1/2" grade 8 bolts with the heads turned down to give them a cleaner look. 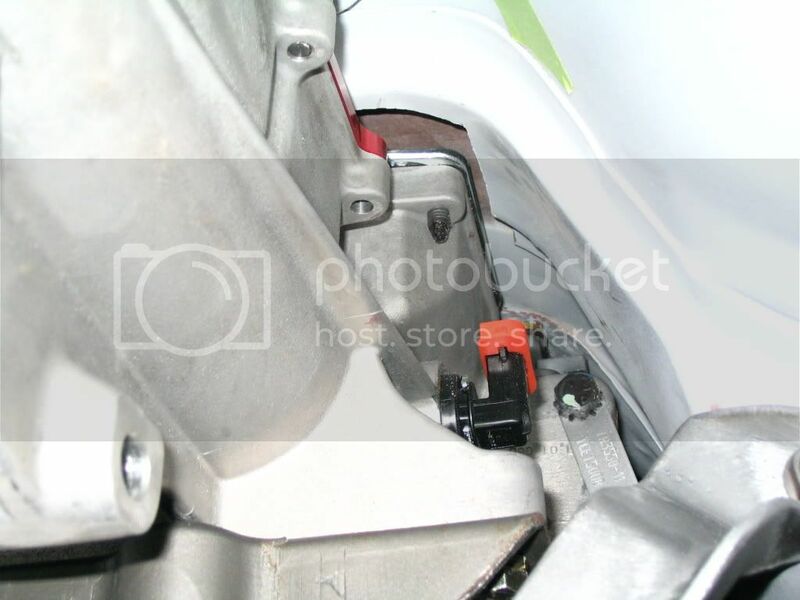 you can see here that the z-bar no longer attached to the block, but a mount on the backside of the bellhousing. i also had to make a new bracket that mounts to the frame rail. i completely cut the bottom arm off the z-bar and made my own. i added a little rod to strengthen it for good measure. also added a grease fitting. 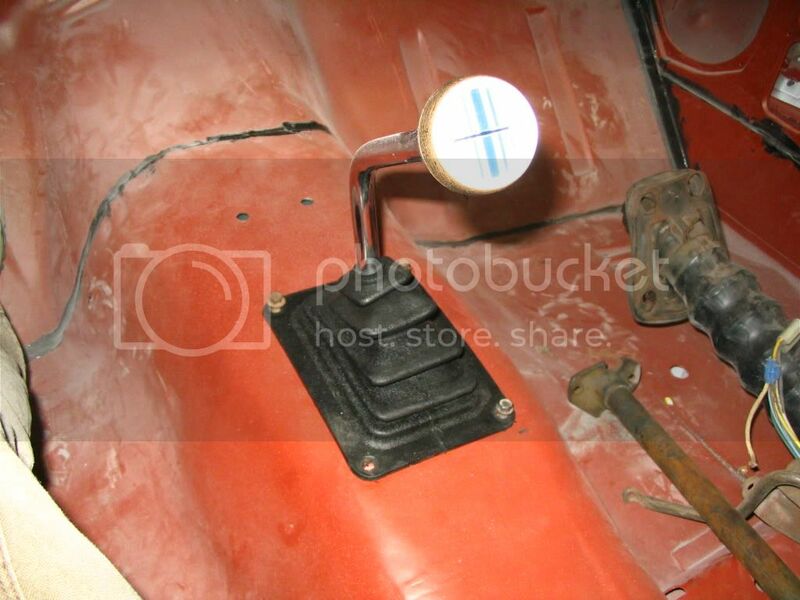 because the shifter hole isn't centered, i ordered a low profile shifter from Modern Driveline. I asked for a 1" left offset, so they built one up for me. (fyi, he was willing to make any offset combination i wanted). the low profile shifter allowed me not to have to cut anything out of the shifter opening. of course, i ended up cutting the stub off the shifter. i made a plate and threaded it so i could mount a 69 shift handle. finishing up the shaker base pan is the last item and everything will be finished mocking up. Your build is looking good. Your fabrication looks really good. 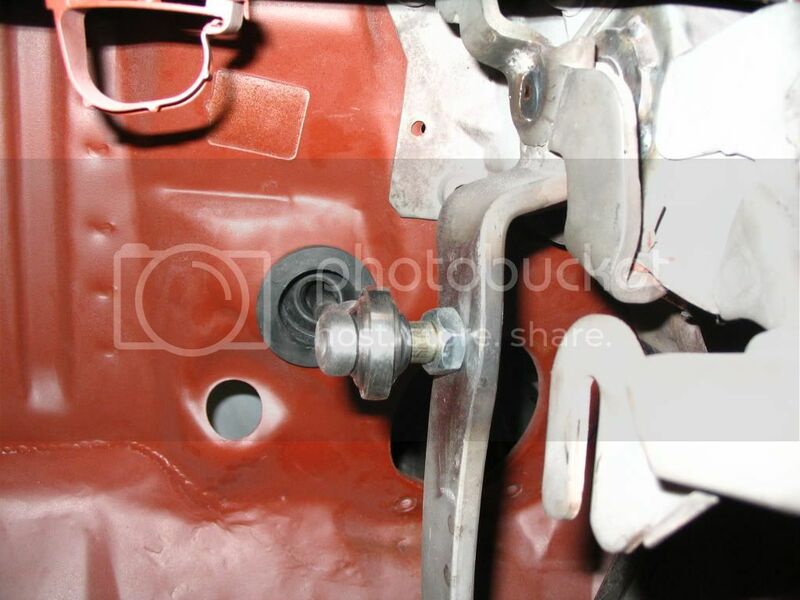 I see you notched your engine crossmember just like I did mine. I only had to notch mine on the left side. 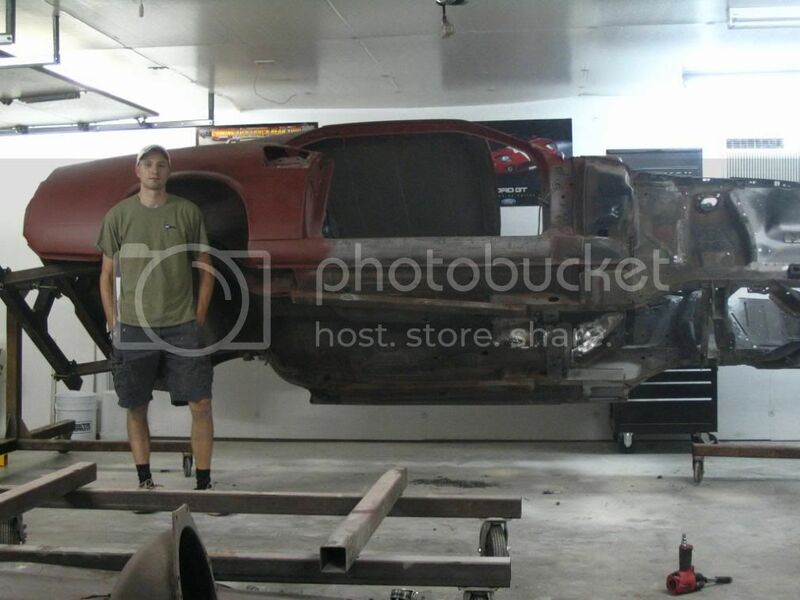 Holy smokes, that is why I wont have a standard car LOL Way too much work to get that thing in there...plus my skills are not near as good as yours LOL. Looking great Demon. i personally HATE automatics! the extra labor was worth it too me! I just noticed the car in your Sig sitting on the BLOCKS and the hair on the back of my neck stood up. Many years ago when I was a Teenager, I had one of my cars up on blocks. One of them cracked and the car came down. Lucky for me, I wasn't under it at the time. Be careful around a car that's up on blocks like that. It could be very dangerous situation. That's a familiar story! I'm still working on my angles just perfect. . I'm picking up a driveshaft vibration at higher speeds. I think I might need to have my driveshaft checked even though it's brand new. nice work! It looks like you are a good welder too. Might I ask what you do for a living? Maybe I missed it but you didnt raise the tunnel? 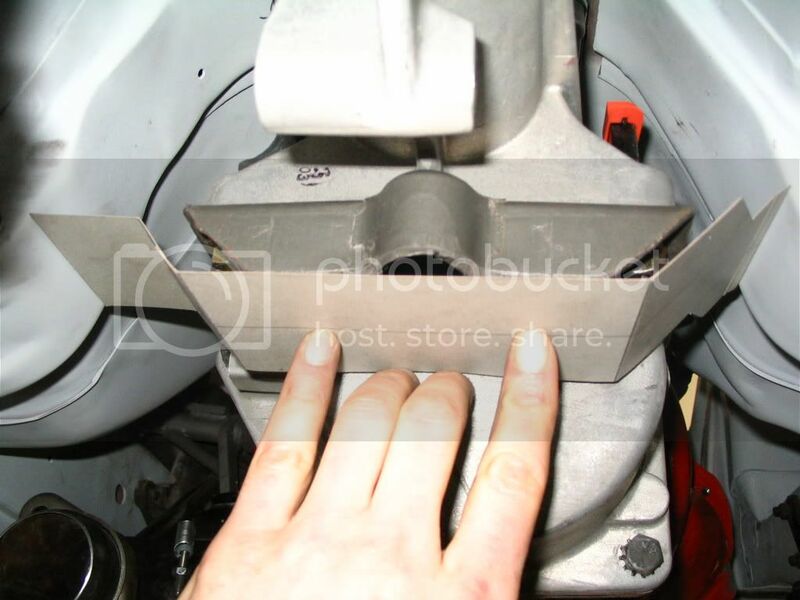 And are you doing the driveshaft and pinion angle next? I am considering a short input shaft TKO500 for my build.